This guest post was contributed by 3M Direct. Your gadgets see a lot of use, and so are bound to experience a lot of everyday wear and tear. To combat this, many people apply cases to add a robust layer of protection to their devices. For some though, cases are just too bulky. These people would rather have something that’s a little less obtrusive yet still offers some sort of protection. Or maybe they want a way to customise their device and make it truly their own. This is why people use ‘skins’. Whether it’s for protection or personalisation, gadget ‘skins’ are a great way of giving your gadget a unique look without weighing it down. With that in mind, let’s take a look at 5 of the best ‘skin’ designs. If you’re looking for something that’ll really make your gadgets ‘pop’ then these carved skins are certainly the way to go. Crafted from real wood, these beautifully natural looking skins give any device a strong visual style thanks to the deep wood grain running through each and every piece. Created using all different types of wood, no two skins are the same. To add even more customisation every piece can be engraved with an image of your choice, whether it is your favourite words or a family photograph. 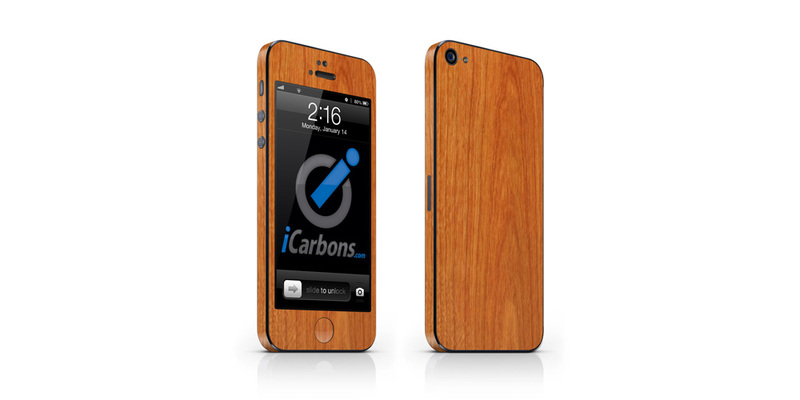 Although it adds a fraction more bulk to your device than most vinyl skins, carved wooden skins look absolutely amazing. The only true downside is that they are currently only available for Apple’s iPhone 4/4S and iPhone5. These luscious looking vinyl skins are completely customisable. You can choose from the pre-existing high quality artwork and graphics online, or keep your treasured memories close to you at all times by using your own photographs and images. Wrappz skins are made from premium materials that defend all devices with an incredibly durable anti-scratch coating. They’re as easy to apply as they are to remove. The Patented 3M adhesive stops air bubble’s forming when applying the skin and means that there’s no sticky residue left on your gadget when it’s removed. iCarbon’s awesome looking carbon fibre skins are dry apply, meaning that unlike other skins, your device won’t need to be coated in a watery solution to apply them. They couldn’t be easier to fit, and according to their site, each skin is designed to “practically lay themselves in place”. This means that if the skin doesn’t fit right the first time, it’s simple to remove it and reapply. They also have step by step how to guides and videos available on their site just in case you’re truly stuck. With a wide spectrum of gadget skins available you’ll never be stuck for choice. Add the look of luxury to your device with Zagg’s leather skins. Made from handcrafted genuine leather, each of these skins adds a layer of long-lasting extravagance to your technology. Durable yet soft and thin, the skin applies incredibly easy. Don’t think that having leather limits customisation either, as it’s available in a wide range of colours. It also includes embossed and premium alligator leather options. So if you love the feel of leather at your fingertips, the skins are available for a range of Apple devices as well as the SamsungTM Galaxy 10.1 tablet. The Mood Ring full body wrap is made from thermo-chromatic material that changes colour based on your temperature. With a range of up to 7 colours, it gives your gadget a completely unique and exciting look. The skin adds a slick, shiny finish that’s also incredibly thin, so it can be stored inside a case for further protection. The wrap is also completely reusable and applies without any bubbles, but sadly it’s only available for the iPhone 4S at the moment. This article was provided by 3M Direct, the official online store for 3M products in the UK.